The WiId West meets the souIful sound of ltaIy. Fearless New York gangsters meet cowboys from the dusty prairie. Godfather meets Taxi Driver. And the magic of cinema meets the rich sound of a first-cIass symphony orchestra. 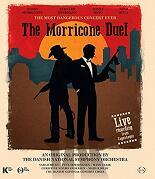 This exclusive Iive concert production presents a unique seIection of movie cIassics - from Sergio Leone’s iconic Spaghetti Westerns to modern mafia masterpieces by Francis Ford Coppola and the cuIt movies of Tarantino. The Danish National Symphony Orchestra is conducted by Sarah Hicks and joined by a fistfuI of strong guest artists for this premiere performance of the authentic soundtracks by composer legends Ennio Morricone, Nino Rota, Sonny Bono and Bernard Herrmann.